Could I possibly have a "Sprint Coupe"...look at the pics. As was sanding down the black paint, I came across this light blue. I know they say the Sprint's came out in 1972, but according to the dash VIN my car is a 1971. But, I'm seeing so much of the blue on the car and the back seats are two tone color. Is there anywhere else on the car I can get information on it, beside the dash VIN? The magnum wheels came with the car, when I bought it. or maybe I just have a "Frankenstein Car"??? What do my fellow mustang friends have to say? Your thoughts, opinions, comments are greatly appreciated. Well first i would check the vin to see if it matches door tag and Buck tag behind headlights, Usually on right side of radiator support ( but some are on the left side )if those all match then probably a clone. 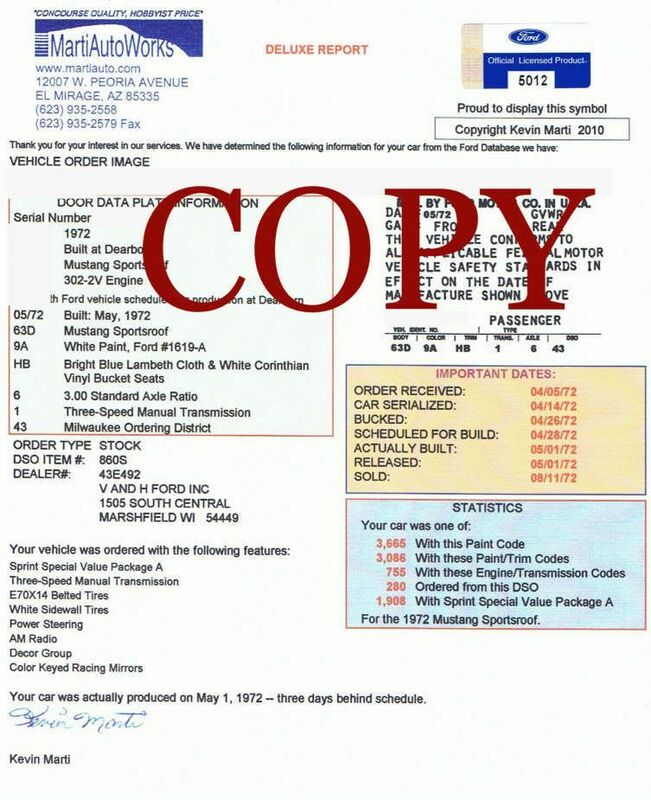 Also 1972 Sprint Coupes and Sportsroofs had a unique TRIM code of ( HB ), as the The 50 Convertible's produced for the Cherry Blossom Parade had a TRIM code that was left ( blank ) on the vehicle dataplate. Vamach1 will be along soon...he is our resident Sprint Expert! My fastback is (was) a Sprint. Only way to prove it is the HB trim code on the door sticker, or get a Marti report (see mine for example). Those rear seats are definitely out of a Sprint; does it have the urethane bumper and Mach1 grille? Another clue might be the blue that is painted under your rear quarter extensions - if there is someone here that is an expert on Sprint's then they might be able to tell you if the car came out of the factory painted like that. If your VIN is right and your car is a genuine '71 then it won't be a Sprint. 71coupe;14335 Wrote: Could I possibly have a "Sprint Coupe"...look at the pics. As was sanding down the black paint, I came across this light blue. I know they say the Sprint's came out in 1972, but according to the dash VIN my car is a 1971. But, I'm seeing so much of the blue on the car and the back seats are two tone color. The back seat looks like sprint seats. That first pic shows a red pin stripe that divided the lower blue and the upper body white. To me it looks like you could have a sprint. I've added a pic of the "buck tag" that was located on drivers side, just behind the front headlight. But, now the question is...how to decipher that code? I have no idea what it means. Can someone help me decipher what the "buck tag" means. I will attempt to decode some of the information. looks to have the interior code of a Sprint. I belive I wouls get a marti report on this on, if you are wanting to restore it as a Sprint.